Registhan Guest House provides unique mud huts and cottage tents located in the desserts of Khuri Village. Situated 1 km from Khuri Bus Stop, it offers a 24-hour front desk and accommodation with attached, Western-style bathrooms. The guest house is located along the famous Silk Route, which was the trading centre between the 8th and 12th century. 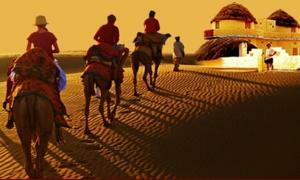 Jaisalmer Airport is 37 km away while Jaisalmer City is 40 km from the guest house. Rooms at Registhan Guest House are fitted with a fan, sitting area and bathrooms with toiletries. Cottages are made of strong canvas material to withstand desert climates. Sightseeing arrangements for wildlife watching, horse safari and campfires can be arranged by the tour desk. Guests will find local handicrafts and food lining the streets of the village. A variety of Indian, European and Chinese cuisine can be enjoyed in the restaurant. Theme parties accompanied by traditional Rajasthani folk dance can be arranged by staff. Free! One further child under 5 years stays free of charge when using existing beds. One further older child or adult is charged INR 700 per night and person in an extra bed. Maximum capacity of extra beds in a room is 1. There is no capacity for cots in the room. Any type of extra bed or child's cot/crib is upon request and needs to be confirmed by the hotel. Supplements will not be calculated automatically in the total costs and have to be paid separately in the hotel.